Majuro (Marshall Islands) (AFP) – The future of the world’s largest tuna fishery will be decided at a meeting in Australia this week, with Pacific island nations demanding tighter controls on a catch now worth US$7.0 billion a year. A record 2.65 million tonnes of tuna was hauled from the Pacific last year, accounting for 60 percent of the global catch, with most of the fishing conducted by so-called “distant water” fleets from as far afield as Europe, the United States, China, Korea and Taiwan. “If distant water nations support sustainability of the resource, then they need to commit to a 30 percent reduction in catches,” Marshall Islands fisheries director Glen Joseph said. A recent international independent assessment found stocks of bluefin tuna, prized by sushi lovers, had fallen 96 percent from their original levels, with juveniles forming the majority of specimens now being caught, pushing the species closer to extinction. It is expected to be “intense and contentious, with many distant water fishing nations resisting attempts by coastal (island) states to improve the management of the tuna resource,” agency director James Movick said. A major problem for the pro-reform camp is the sprawling nature of the WCPFC, which was set up 10 years ago to manage fishing in a vast area of ocean covering 20 percent of the Earth’s surface. It has a mix of 25 members, ranging from tiny Niue (population 1,200) to the European Union, and makes decisions by consensus, which critics say makes it difficult to get anything done. “Time is running short for the WCPFC as a whole to demonstrate that it is capable of breaking new ground,” Forum Fisheries Agency deputy director Wez Norris said. In a hopeful sign for reformers, Japan and the Philippines have made a joint proposal with eight island nations to adopt conservation measures, including reducing bigeye tuna quotas. However, organisations such as the American Tunaboat Association fear becoming bound by “draconian” regulations if reforms are approved, questioning the need for drastic conservation measures. “There is no evidence that tropical tuna fisheries are in jeopardy,” the association’s executive director Brian Hallman said. 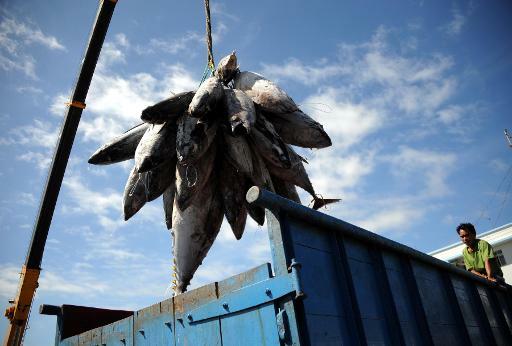 Greenpeace said there were more than 3,300 fishing vessels “plundering” Pacific tuna stocks and at least 45 more were under construction in Asian shipyards as demand for fish grows and stocks elsewhere dwindle. “There are just too many fishing vessels chasing too few fish. We believe that the tuna fishery cannot sustain any longer this immense amount of pressure being placed on the Pacific tuna fishery by distant water nations,” Greenpeace oceans campaigner Duncan Williams said. The Cairns meeting comes a week after the International Commission for the Conservation of Atlantic Tunas (ICCAT) rejected pressure from Japan to increase quotas for bluefin tuna in the East Atlantic and Mediterranean. After marathon talks, ICCAT concluded that the annual quotas would remain at 13,400 tonnes in the eastern Atlantic and 1,750 tonnes in the western Atlantic.